The Lammergeier, also known as the Bearded Vulture (Gypaetus barbatus), is classified as an Old World Vulture, however looking at the Lammergeier there is little resemblence to “real” Old World Vultures, e.g. like the Griffon Vulture (see in the next post). This is most evident with the lozenge-shaped head, and of course the beard. The only other vulture similar is the Egyptian Vulture. They range from the high mountains in southern Europe, the Caucasus, parts of Africa, the Indian Subcontinent and Tibet. They feed predominantly on carrion, with a liking for bones and the marrow inside of bones. Living in the mountains the Lammergeier also needs to be tough, especially as they usually lay one or two eggs in mid-winter! Blimey! During a day photographing vultures near the Spanish boarder with Andorra for ten hours I saw half-a-dozen of these majesties of the mountain skies. The Lammergeier is almost entirely associated with mountains and inselbergs with plentiful cliffs, crags, precipices, canyons and gorges. They are often found near alpine pastures and meadows, montane grassland and heath, steep-sided, rocky wadis, high steppe and are occasional around forests. So, places like the Pyrenees in Europe, Himalayas in Asia, Atlas Mountains in North Africa highlands of Sudan, and even as far south as the Drakensburg. Not surprisingly, the Lammergeier seems to prefer lightly-populated areas where predators, who provide many bones, such as wolves and Golden Eagles, have healthy populations. Although they occasionally descend to lower elevations, circa 300-600 m, the Lammergeiers are rare below an elevation of 1,000 m and normally reside above 2,000 m in some parts of their range. The Lammergeier is locally threatened. It naturally occurs at low densities, with anywhere from a dozen to 500 pairs now being found in each mountain range in Eurasia where the species breeds. The species is most common in Ethiopia, where an estimated 1,400 to 2,200 are believed to breed. Relatively large, healthy numbers seem to occur in some parts of the Himalayas as well. 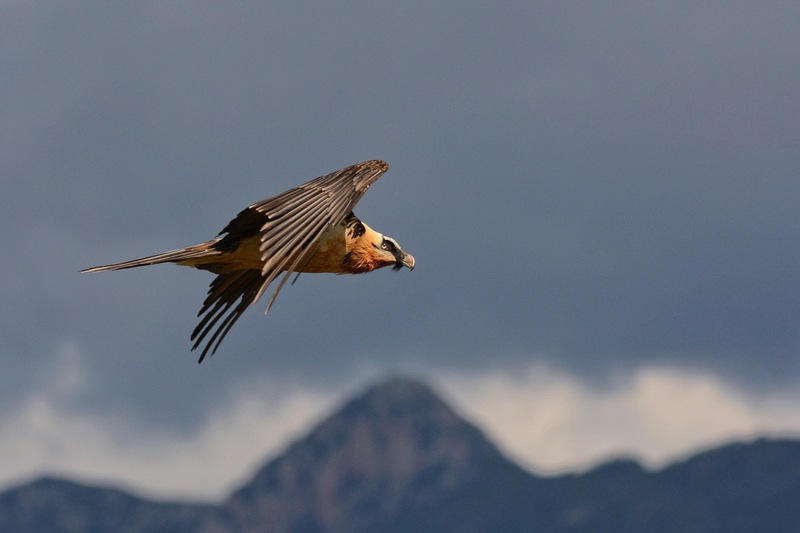 The Lammergeier was largely wiped out in Europe by the beginning of the 20th century, but has been locally reintroduced and is beginning to re-establish itself in protected areas, e.g there have been successfull reintroductions in the Pyrenees of Spain and the Swiss and Italian Alps, both populations have spread themselves over into France. With these types of legendary birds, there is always myths, and the Lammergeier has it’s own myth. It was formerly persecuted in significant numbers because people feared (without justification) that it regularly carried off children and domestic animals. However, never proved (domestic animals of course). Maybe two weeks in the Pyrenees for next summers vacation? After all the majestic Lammergeier allegedly likes naughty children. This entry was posted in Birds, Europe, Nature, Photography and tagged Birds, Europe, Nature, Photography, Spain, Travel, Vultures. Bookmark the permalink. Beautiful photograph, lovely crisp details of the bird. Interesting information about this particular species, found in many mountainous region on four different continents…….incredible! Good one Mark, thanks.